The question used to be Leno or Letterman? Letterman or Leno? For the staff at Needtovent, we initially preferred Letterman -- his acerbic monologues often hit below the belt, pushed the envelope, and, on many occasions, cut deeply. Then came the heart attack and a new Letterman emerged, one that was tame, lazy, boring. Leno, on the other hand, stepped up his game delivering a full ten minutes of new material each night that, surprisingly, grew a bit edgier, but, more importantly, was genuinely and consistently funny. Then came the "retirement" only to have a reemergence just a few months later. There's no denying that THE JAY LENO SHOW will be breaking new ground, becoming the first-ever prime time program to air every night of the week. The question, now, is whether or not this Favrian return will also be a success. Based on last night's premier edition the jury is still out. Perhaps the key is determining who constitutes the primary audience for THE JAY LENO SHOW. Needtovent is an openly gray institution, and so we naturally figured it would be the AARP crowd who previously wanted to watch Jay in the 11:30 p.m. (Eastern) time slot but couldn't stay awake long enough to even get through the opening monologue. At least that's who we thought NBC would appeal to -- an admittedly niche demographic, one that might be construed as possessing less purchasing power than the more desired 18-49 crowd, but yet sizeable enough in today's fractured television marketplace to be financially viable. After all, an entire week's worth of Jay's one-hour programs will likely cost less than a single hour of prime time drama such as previous NBC hits like ER, LAW & ORDER and L.A. LAW. Of course, those were all a long, long time ago. Having Jerry Seinfeld as the first guest was an excellent choice. But what in the name of Chester A. Riley was NBC thinking when the other guests booked were rappers Jay-Z, Rihanna and Kanye West? What a revoltin' development this is... Talk about a bird-brained decision by the Peacock Network. For the vast majority of senior citizens, this musical choice was more like Metamucil -- and that's a pretty tough pill for senior citizens to swallow around bedtime. In the final analysis, the most important question is whether THE JAY LENO SHOW was entertaining. 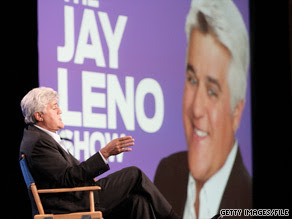 Leno publicly promised "three times the comedy" of his former TONIGHT SHOW. We'll give the monologue a B+, the Seinfield segment (including the Oprah video) a B-, the two videotaped inserts a C, the mock Obama interview a C-, the pathetic Kanye West interviw an F, the aforementioned Metamucil musical number an F and the closing Headlines (after over three months to cull the very best) a disappointing B. Looks like Jay's math skills elicit a failing grade. Final analysis -- we find THE JAY LENO SHOW to be in trouble, especially if the guest selections don't become more consistently appropriate and the video segments remain lame at best. 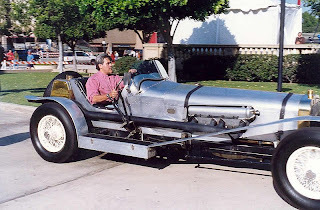 Not to worry, Jay can always drive off into the sunset in one of the exotic cars in his collection -- this fabulous Hispano-Suiza 8 being just one possibility. With Leno laying this egg, how long will it take NBC execs to fill these prime-time hours? I'll bet they're already scrambling to do so.